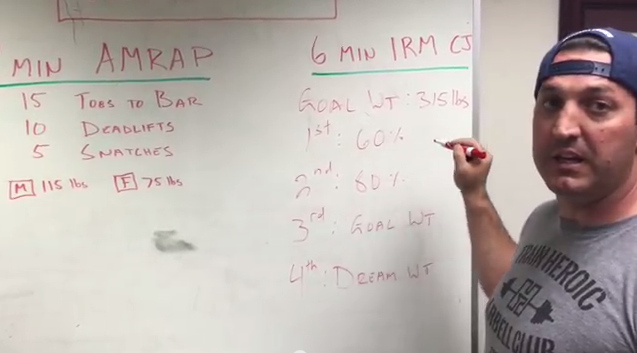 Coach Dave talks about 15.1 strategies from a coaches perspective. -As early as round 2, break up the toes to bar into 8 and 7. Possibly alternate between pronated, supinated, and mixed grip if necessary. -Keep hips high for the deadlifts to shorten the movement pattern and shave some time. It's not heavy enough to tax your low back enough to be concerned. -Keep hips high for the snatches and make sure you're cycling them efficiently (touch and go). - As for the Clean and Jerk, you will have time for 3 to 4 attempts. You should go into the workout with a goal weight. Your first attempt should be roughly 60% of that. Second attempt at roughly 80% of that. Third attempt at your Goal Weight. If theres time and you've made your goal weight, put an appropriate final attempt on and crush it! Good Luck everyone!